Ships have always been changing and evolving. New technology and materials, and even different kinds of cargoes have all meant that vessels have to change to keep up. Now, perhaps more than ever before vessel shapes, designs, and capabilities are evolving like never before. In our new Crewtoo series, we look at those changes…this time we look at forecastle. The forecastle or fo’c’sle, is a raised deck at the bow of a ship. In modern times, the fo’c’sle deck is typically only a single deck extending to the end of the superstructure. This is where anchoring operations and forward mooring stations are carried out. Nowadays, on vessels with aft accommodation, they are little more than a climb up a companion ladder – and an expanse of bitts, bollards and winches. While the chain locker pipes run downwards, and underneath are often paint and rope stores, and the forepeak tank. Today, this is a place where crew take selfies as the vessel expanse curves astern of them. Or where you can lean forward and see the bow below cutting or pushing through the water. If you are lucky, you may even occasionally get to see some dolphins bow riding. This is all a great change from the past when the fo’c’sle was either a form of fortification, or where eventually the crew lived. The designs of vessels through history have all used the area to some extent, but the purpose has changed drastically. One important role of the fo’c’sle decks is to increase the bow height, generally increasing seaworthiness of the vessel and reducing green water shipped. In this manner, fo’c’sle decks can be used together with, to reduce, or to eliminate sheer. For vessels which operate in demanding environments, the fo’c’sle deck may be a form of shelter deck used to enclose and protect equipment. Today that is the deck machinery related to mooring, but in the past, this could have been related to fighting and combat. The area has always been a built-up section, that is one of the common themes that most vessels have had in common through the ages. However, in the past it was built higher to be used for combat and counter-boarding purposes. In medieval shipbuilding, a ship of war had a forward castle. This was usually constructed as a tall, multi-deck castle-like structure in the bow of the ship. It served as a platform for archers to shoot down on enemy ships, or as a defensive stronghold if the ship were boarded. A similar but usually much larger structure, called the aft-castle, was at the stern end of the ship, often stretching all the way from the main mast to the stern. These constructions were good for fighting, but not so helpful for sailing. It seems medieval naval architects had a lot to learn, and the sinking of the “Mary Rose”, King Henry VIII’s flag ship was down to the fact that there was far too much ship high above the water, than there was below it. This meant that as weapons, ammunition and people climbed higher as battle progressed, then the centre of gravity climbed too. Anyone with a modicum of ship stability knowledge would know what happens next. It seems that metacentric heights were not taught at medieval nautical colleges. Thankfully for sailors, technology changed and cannons were introduced, so eventually gunfire replaced boarding as the primary means of naval combat during the 16th century. This meant that the medieval forecastle was no longer needed. So, the design of vessels had to adapt. Later ships, such as the galleon, had only a low, one-deck high forecastle. Though, while they were no longer used for boarding purposes, the raising of decks on the bow remained an important part of ship design. By the end of the 19th century, a raised forecastle had once more become a typical feature on warships. This was an attempt to keep forward gun positions from getting unacceptably wet as the vessel ploughed through the waves. In addition, the forecastle was beginning to take on a new significance, as essential machinery such as the anchor windlass was forward. As technology ramped up, and steam was used for heavy deck tasks, then the equipment and machinery needed to be protected from breaking seas. The modern foc’sle is a place of activity during mooring and anchoring. 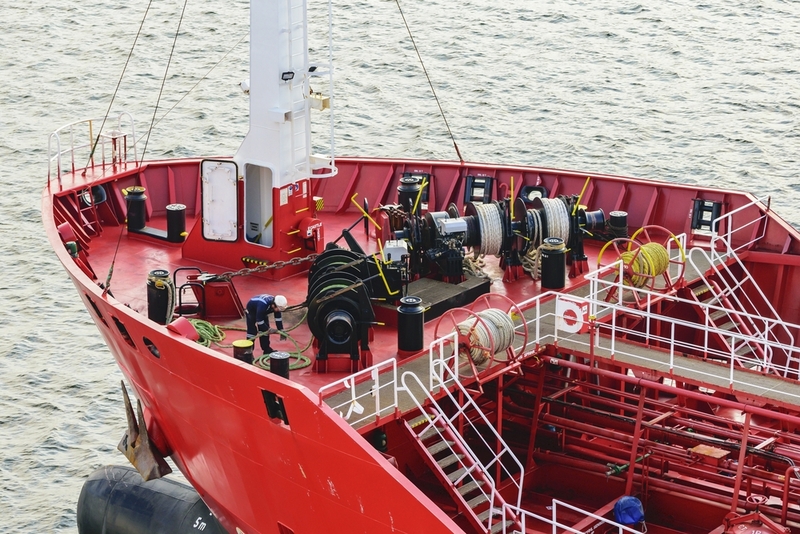 It houses the windlass, as well as other vital components of the anchoring equipment. With the anchor chain passing through the hawse pipe, across the foc’sle and into the chain locker, the foc’sle is of vital importance. According to the International Load Line Convention, there are certain parameters which mean that the foc’sle can still be considered as a “superstructure” on the vessel. This depends on the distance of the construction from the ships sides. While some designs are raised direct from the hull, others may still constitute a separate and distinct structure. Just as they always have. There are many new and amazing designs of vessels emerging – those such as the X-BOW and Swan Bow. They look futuristic, and are designed to bring the accommodation and equipment forward, thus leaving a large working area at the stern. Even these vessels have to make consideration for foc’sle arrangements. Their higher bows make for increased buoyancy and protection. These are interestingly enclosed foc’sles – and like the vessels of the past there is a move to build this area upwards. Thankfully naval architecture has come a long way over the past centuries, and now the forecastle brings more benefits for sea keeping than for fighting.